SalafiTalk.Net - Abu Usamah adh-Dhahabi's False Notions! » Abu Usamah adh-Dhahabi's False Notions! Posted By Topic: Abu Usamah adh-Dhahabi's False Notions! On the night of Tuesday 16th September 2008 (16th Ramadaan 1429H) Shaikh Falaah Isma'eel responded to the manhaj of the Jamiat Ahlel-Hadith UK, clearly showing and proving in detail why their manhaj is deviated and misguided. He was asked concerning Abu Usamah Dhahabi and his "shaikh" Suhaib Hasan as well as the Jam'iyyah Ahlel-Hadith (UK) as an entity and its manhaj. The way of the Shaikh Falaah Ibn Ismaa'eel is always to begin by laying down the foundations and showing them clearly as being the path of Ahlus-Sunnah wal-Jamaa'ah, then he shows how the various jama'aat such as the "Jamiat Ahl-e-Hadith UK" and the "Jam'iyyah Ihya Turath al-Islami (Kuwait)" have opposed and comprised and aided in the destruction of these foundations. He stated that both these organisations are politically driven and have compromised their fundamentals in pursuit of power and politics; they will compromise with the innovators who are the avowed enemies of Salafiyyah in attaining their goals. He quoted some beautiful points of benefit from Imaam Al-Albaanee showing how these organisations begin upon the Sunnah, then due to their desire to gather people and increase numbers, they begin to compromise their religious beliefs and methodology - they enter into politics and then a veil of silence overcomes them - they are no longer able to speak about the detailed issues or the clear manhaj of Salafiyyah, they are no longer able to refute the people of bid'ah, nor do they enjoin the good and forbid the evil except in generalities; rather they join ahlul-bid'ah, sign pacts and accords with them, join their platforms - they unite upon the lowest common point of agreement and the manhaj and usool are thrown "out of the window" - in this manner they oppose the Sunnah and aid in the destruction of Salafiyyah! The Shaikh advised them to make tawbah, repent and return to the manhaj of the Sunnah, return to the true path that they have deviated from. He also mentioned how people attach themselves to certificates and to the fact that they are graduates and therefore qualified to teach, yet the certificate becomes only a means to get their goals. He said he knows many people who graduated and then opposed the Sunnah and the usool. Note: Muhammad al-Maghrawi is a graduate and has been refuted; Safar al-Hawali is graduate, with a PhD; Salman al-Awdah is a graduate; Abdur-Rahman Abdul-Khaliq is a graduate; Suhaib Hasan is a graduate; Yasir Qadhi is graduate; Abu Muslimah is a graduate; Bilal Philips is a graduate; Abu Usamah is a graduate; Tawfique Chowdhury is a graduate and so on - yet their certificate did not protect them from misguidance and innovation. The education is a trust that they violated and a proof against them not a tazkiyyah for them! The beauty of these words of Shaikh Falaah show us once again we are not concerned with taqleed and blind-following of those who praise the Jam'iyyah. This is an issue knowing the Usool of the Sunnah, and of evidences and proofs - this is not an issue of taqleed! If we were people of taqleed, then it would more worthy that we make taqleed of the Four Imaams than that we make taqleed of modern times. We are supposed to be people of Sunnah and evidences. In conclusion: we make mention of the words of Shaikhul-Allaamah Ubaid al-Jaabiree wherein he said that anyone who knows Ubaid al-Jaabiree knows that he opposes the groups and parties of hizbiyyah and siyaasah (political activism) that misguide the people. He goes on to mention that this group 'Jam'iyah Ahlel-Hadith UK' is not a Jamaa'ah upon the Sunnah - that they have nothing to do with Hadith and Sunnah - Their only connection to the hadith is that it happens to appear in their group's name! He continues to say that he holds it impermissible to cooperate with this organisation or to organise events with them or participate along with them. Yet we find the likes of Abu Usamah Dhahabi staunchly adhering to these organisations, defending them and compromising alongside them (and then he wonders what all the fuss is about!). So after all this, we say: what is it that Abu Usamah Dhahabi is confused about exactly?! What evidences is he after exactly? The fact that his "shaikh" Suhaib Hasan openly praises and sits with innovators and extreme soofees, such as Muhammad Adam al-Kawtharee and the head of Ikhwaan Yusuf al-Qardaawee? Or the fact that Suhaib Hasan is on the European Fatwa council with Al-Qardaawee at its head, holding the role of president? Or is it the fact that his other "shaikh" Abdul-Hadi holds that the misguided Maudoodi was a great scholar of international standing? Or is that his "shaikh" Suhaib Hasan celebrated the Prophet's "birthday" alongside the Tory Party and a group of Soofees? Or is Abu Usamah unaware that Salma Yaqub, of the Socialist Party who (in her own words) "would wage a campaign against the hijaab in Saudi Arabia", delivered a lecture in the mosque in which he himself is the khateeb, i.e. Green Lane mosque?! Was he unaware - or is it just as he claims (and swears by Allaah) he was unaware of the fact that Waleed ibn Uqbah (radhi Allaahu 'anhu) was a companion when he accused him of being a Faasiq! Yet on the tape where he made this evil comment, he clearly states, "There was a companion by the name of Waleed ibn Uqbah, radhi Allaahu anhu" and then continues to declare him to be a faasiq! Or is it that Abu Usamah himself sees himself beyond the restrictions of the Salafi manhaj - so he himself participates with people of misguidance, such as those who signed the pledge to unite (with grave-worhipping soofees) upon misguidance such as lecturing alongside Haitham al-Hadaad, Abdur-Raheem Green, Tawfique Choudhury and Yasir Qadhi? Or is it that he is unaware that his colleague (in the Jam'iyah) Usamah Hasan, the son of Suhaib Hasan - who is also a khateeb and a Ramadhaan imaam in the Jam'iat Ahlel-Hadith Masjid, Leyton in East London who states that he now rejects the taking of the texts upon their apparent (dhaahiri) meaning and regards himself to be a "soofee-wahaabi", that muslim women do not have to cover their heads, that listening to music is halaal, that it is possible humans may have evolved from apes; that Britain is the most Islamic country in the world; that he would like to see a Turkish-style secular regime in the Islamic lands!? Or is he unaware and ignorant of another "shaikh" of his, Bilaal Philips (whom he is constantly praising and defending), who praises Mawdoodi and Hasan al-Banna and raises them to the level of Mujadideen (revivers of the Religion) and regards anyone who criticises them like those who criticise Al-Hafidh Ibn Hajr and Imaam An-Nawawee (rahimahumullaah)!? Or has he forgotten his own recent praise of Zakir Naik - the one who believes it is quite acceptable to call Allaah with the title Brahmah, Shiva and Vishnu!? Is he unaware of the statements of the Scholars regarding Muhammad al-Maghraawee and his deviations, and likewise Usamah al-Qoosee - No he is not, yet he still joins them in their conferences and translates for them and brings to English speaking audience the words of those whom have been refuted by the Scholars!? And then he wonders what all the fuss is about! Instead of being alongside the evidences and proofs, he turns his attack and enmity towards the Salafis. Or is it that all of this acceptable to you, because Shaikh Wasi'Ullaah still praises the Jam'iat Ahlel-Hadith UK? And as they claim, "we are with Shaikh Wasi'Ullaah"!! This is taqleed in reality. And this taqleed is forbidden even for the general folk, i.e. to continue to take from a shaikh in this particular point, even after the evidences have been provided and he is shown to be incorrect in this particular matter. So the measure is no longer what the Qur'aan and Sunnah and Salaf were upon - the new measure is "we will hold to what our shaikh has said"! This is the root of taqleed! So now we find Abu Usamah openly attacking a group of Salafis, accusing them of hizbiyyah, extremism (ghuloo), and Hadaadiyyah - and declaring them to be ahlul-bid'ah. Why? - because they briought into the open his established public mistakes. Yet he sits in the belly of a jam'iyah known by those ulamah who have studied the evidences and have deep insight into the manhaj to be a "political group" and not a Jamaa'ah upon the Sunnah. He defends his group, praises its heads, ignores their mistakes, and joins in their errors and throws accusations against the Salafis - and then invokes the curse of Allaah upon himself and his children, asking Allaah to make them die as jews if he does not wish to make tawbah?! It is not forgotten by those who know Abu Usamah, how he worked and associated himself with Jami'yyah Ihyaa Turaath of Kuwait for years, knowing full-well from the scholars that this was a deviated and partisan group. Till this day he continues to praise and translate for its speakers, even attempting recently to use them in his claim to make "rectification" with the Salafis! How does he expect to make rectification with the Salafis by using speakers who belong to Jam'iyyah Ihyaa Turaath?! Or has he also forgotten the statements of Shaikh Al-Albaanee, Shaikh Rabee', Shaikh Ahmad an-Najmee, Shaikh Muhammad ibn Haadee, Shaikh Ubaid Al-Jaabiree, Shaikh Muqbil ibn Haadee (in fact over 150 scholars) all warning against this group? Yet he wants to make 'islaah' with the Salafis by the use of this group! Is he real? So we do not want to hear his claims to tawbah. A mere claim means nothing - he has been claiming for years with the mantra, "By Allaah, I want to make tawbah. May my children die as Jews! I want to make tawbah!" Yet he has not embarked upon this tawbah. His contradictions, deceptions and deeds belie his claim. And IF he makes tawbah, it must be as clear as the sun in the sky with no ambiguities - he should take the evidences from the scholars and stop thinking he is a mujtahid who has valid opinions along with the Scholars, he has no such ability and he has not right to scholarship. He must seek the forgiveness of those who have tried to correct him over the years, to whom he has shown so much enmity and venemous hatred. He should seek the forgiveness of those Shaikhs he has spoken ill of such as Shaikh Rabee' and likewise Shaikh Ubaid (against whom he has made nasty insinuations); he must leave his association with the groups, individuals and organizations of misguidance; he should declare his freedom from those deviants he has been defending for years. Then after that he should stop talking and lecturing. And then learn the usool and manhaj - sit with those who know; abandon the people of innovation and hizbiyyah, do not keep company with them, don't make excuses for them - just be silent and listen. It is not the case, and nor the way of the Salaf, that one is a caller to misguidance one day, and then he becomes the greatest caller to Sunnah the following morning! No, Wallaahi, no! He will again become an evenue to misguidance. This is not the Salafi way. Learn the truth, learn the aqeedah, learn the usool and then act. Somebody, should contact The Grand Masjid in Kansas City and advise the brothers. Last time I was there in the early spring of 2008 when the Shaykh came from Masjid Al Aqsa. They were defending Abu Usamah by way of the statements of Shaykh Wasee'ullah. They defended him very energetically. I was treated pretty hostily by the Ra'is of Grand Masjid. Please contact me about this issue because there were 2 other brothers there during that venue. I dont know if I should mention them publicly. They are regarded as Imam's and callers to the da'wah and when I questioned them about why the masjid was selling the tapes of Waleed Al-Basyouni, Bilal Philips and Abu Usamah or what their position was regarding Abu Usamah I recieved some answers that I did not know how to judge. Is he lying? Is he deceiving? Or is he just downright foolish? Abu Usamah adh-Dhahabi Swears By Allaah That He NEVER Knew That Waleed Ibn 'Uqbah Was A Companion! This is a recording which Abu Usamah made and spread (in August 2008) in refutation of Maktabah Salafiyyah claiming that he his making 'Jihaad' against the deviants! Here we have him calling Waleed ibn 'Uqbah (radhi Allaahu 'anhu) a faasiq!! This is a recording (from a couple of years ago) in which Abu Usamah shows his deceptive and contradictory speech. In the clip above you heard him say and swear by Allaah that he did not know that the man he called a faasiq was a Companion, yet here we have have him beginning his story with the words, "there was a Companion by the name of Waleed ibn 'Uqbah, radhi Allaahu 'anhu... and he was the brother of Uthmaan ibn Affaan" and proceeds to call him a faasiq. So he did know he was a Companion! The issue is not so much the mistake. Mistakes are corrected with tawbah and Allaah is at-Tawwaab ar-Raheem. The problem is his deception and trickery that he beguiles the people with, and has done so for years. Unsuspecting youth who do not know better are deceived by his flowery speech that conceals the reality of his condition. Do you remember his so-called tawbah for speaking ill of Shaikh Rabee' a few years back, in which he claimed that he had made tawbah for saying, "I saw things in Shaikh Rabee' that prevent me from taking his criticisms.." (or words to that effect)? Then immediately after that 'tawbah' he said, "but no one asked me what I saw"!? So what happened to the tawbah? Shaikh Falaah Ismaa'eel said, "This is a false tawbah! He does not see his mistake, he still believes he is correct." He veils his speech with deception and abiguities to deceive the ignorant listener. Our advice to the listener: Stop listening to him.. for your own safety! 2 -A companion of the Messenger of Allaah. 3- A munaafiq. That is, someone who has the hukm (legal ruling) of a Muslim in this life. Dawud Adib the son of David C.White Sr.
Abu Usamah is back with the Hizbee Abu Muslimah! "You are a hidden hizbee and a liar, you are an enemy to the Dawatus-Salafiyyah and I have seen the likes of you many times before." "What has to be understood (is that) I haven't changed any position from before, during and up to right now, I haven't taken back any of those statements I haven't changed anything and we'll keep going..."
"We have a man here in America who is known for partisanship, and he is Aboo Muslimah, and you ruled upon him with Hizbiyyah, that he is a Hizbee. Now we hear that you have taken back that ruling, so we want to know is this man Hizbee or is he Salafee, because we heard that you had retracted that?" So if this Hizbee or that deviant or that one claims that they have repented and returned back to the Manhaj of the Salaf, we say welcome with this repentance, but we will remain cautious about him until we see this repentance as clear as the sun that he has left that which he was upon and become firm on the truth, only then is he from us and we from him." "Then how do we treat this man specifically?" He said, "The same way you treat all of those who oppose the Salafee Manhaj. By staying far away from them and giving Dawah to the manhaj of the Salaf and being firm upon it and striving to keep the people steadfast upon it and warning against anyone who opposes it." "So do we say that he is Salafee?" The Shaykh answered, "No! Dont say about a man that opposes the manhaj of the Salaf that he is Salafee. Don't say that a man is Salafee until you are sure that he is upon the Manhaj he is honoured by it, and calls to it, he loves and unites based upon it and hates and separates because of it. This is a Salafee but someone who claims that he is Salafee and defends Ahlul-Bidah and defends them against Ahlus-Sunnah this is not a Salafee whatsoever, whoever he is, Arab or Non-Arab in the east or in the west, because Salafiyyah has special qualities, signs and affairs that differentiate its people from others, in Walaa and Baraa and aqeedah and Dawah, and the stances that they take." "We have been afflicted in these days with those who falsely accuse true Salafis of being extreme and harsh in al-Jarh wat-Taýdeel (praising and criticising) and in other areas. He wages war against them in the most severe fashion whilst he makes peace with the people of innovation and desires, heaping praise and commendations upon them. So (you find that) he falls into tamyeeý when dealing with the people of innovation and at the same time he shows a destructive form of extremism towards the people of Sunnah and the truth. His anger and his pleasure are in accordance to that which he desires and in agreement with those whom he aspires to embrace from the wealthy and rich." Excerpts taken from the article ýModeration in Islamý. قال أبو أسامة خليفة الذهبي في رسالة إلكترونية: "أخي هذا كلام أكبر محدث الآن بدون نزاع! من الأشياء المؤسفة التي تجدها هذه الأيام إذا شخص لا يوافق موقف الشيخ ربيع يصوّر أنّه ضدّ العلماء كلّهم و يوجد شئ في سلفيّته! كأنّ من يخالف الشيخ ربيع و من معه خالف إجماع العلماء! حتى أنّني قرأت أنّ الشيح ربيع و من معه من المشايخ جمهور العلماء! بوضوح هذا سخيف و مفقود من عقل فضلا عن أن يكون له دليل. من أغرب الأشياء التي حصلت لي هذه الأيام أنّ بعض الرسائل وصلت إلىّ من أناس ينصحونني أن أتوب و أتراجع و أكون مع الشيخ ربيع و أن أصحّح ما تسبّب في التحذير منّي! و كلّما أسألهم أن يبيّنوا لي لماذا هم يعتقدون أنّ موقف الشيخ ربيع واضح أو لماذا هو عليّ أن أوافقه أو أتوب؟ هم دائما يجيبون بنفس الجواب: "لا أدري المسائل بالضبط و لكنّها ما زالت واضحة"!!! هذا هو الجواب 100% من الأوقات بدون استثنى, و هذا عجيب جدّا جدّا! كيف شخص يتّخذ موقفا, و يعتقد أنّه الحق و لا يدري لماذا هو الحق؟ هذا من الاتّجاهات الجديدة عند السلفيّين اليوم! و كما قال الإمام محمد عبد الوهاب التقليد من أصول الجاهليّة! وقال في رسالة أرسلها إلى الأخ أبى زاهد جليل ميكنس: هذا الشخص كان من أصحابي قبل أن يصبح سلفياً متطرفاً، افضل من الناس جميعاً في سلفيته وفهمه. هو الآن مقيم في مصر. كان مع الشيخ أسامه ولكن بعد أن صدر الكلام في الشيخ الأخوة من فلادلفيا أسقطوه كأنه بطاطا حارّ مجرد أن تكلم فيه الشيخ ربيع، أنا سمعت ولاحظت أشياء من الشيخ ربيع تمنعني أن أقبل كل ما يقول في أبى الحسن وعلى حسن وسليم الهلالي حفظهم الله. والله لو أراد الشيخ ربيع أن يهدم جمعية القرآن والسنة ليس عليه إلا أن يحذر منا بكلمة واحدة ثم ستنتشر (تلك الكلمة) في كل مكان على الإنترنت وشوارع بوبا فيل (Bubbaville) وليس على الشيخ أن يعرف شر تلك الكلمة لأنه هو إمام الجرح والتعديل وسينشر الأخوة كل ما يقول بدون سؤال! Can this please be translated? Saed Rageah who was one of the speakers in the "Road to Glory" Seminar along with Abu Usamah is one of the instructors at "Al-Maghrib Institute". Al-Maghrib is the same institute where Yasir Qadhi teaches and which was founded by Muhammad AlShareef. May Allaah guide all of these speakers and us to the correct manhaj. Here is an old post which has more info about, Saed Rageah. "Birds of a feather flock together"! A good way of making money and misguidance thrown in free of charge! 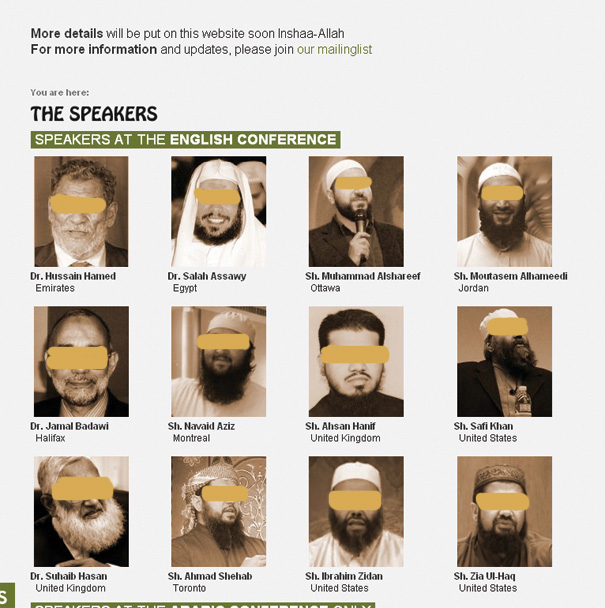 Abu Usamah stated in the winter Green Lane 2010 conference: "We are on Salafiyyah my brothers!" He went on to say that he has sent messages to the brothers (whom he referred to in his lectures as hizbees and Hadaadees) that let us come and sit and make Islaah and make the Shaikh (who was sitting next to him) the judge. Let us pause here. After nearly 20 years of deviation and calling to misguidance (alongside scattered invites of Salafi shaikhs here and there) - you want these people who you refer as 'Hadaadee and hizbees' to sit with a shaikh who has no idea of what has been going on at Green Lane to judge? You want him to judge on your (and Green Lane Mosque's) relationship with Zakir Naik, Abu Muslimah, Saeed Rageah, Bilal Philips, Haitham al-Haddaad, Suhaib Hasan, Muhammad al-Maghraawee, Abdur-Raheem Green, Ali-Hasan al-Halabi, Abul-Hasan al-Ma'rabi, Al-Maghrib Institute, Muhammad Shareef and yet he knows nothing of them? Ajeeb that you abandon those who are more knowledgeable of you from the Scholars; those who know of the deviations of these characters and of Green Lane in detail and with proofs; those scholars who explained the deviations of Green Lane with proofs; YET you and the mosque that you represent who is united (by its own admission) with the Manhaj of Ihyaa Turaath al-Islaamee abandon those mashayikh who are more knowledgeable of this affair (and the intricacies of these deviated personalities) in favour of those who have little or no background?! Why abandon Shaikh Rabee', the one most knowledgeable in the arena of jarh wa ta'deel and the most well-grounded in the deviations of the hizbees and plots of ikhwaan?! Why abandon and ignore the likes of Shaikh Muhammad ibn Haadee who knows the scheming of Ihyaa Turaath and has spoken and written regarding them in detail, as has Shaikh Ahmad Baazmool and Shaikh Ubaid al-Jaabiree and others?? Why leave off Shaikh Muhammad al-Anjaree and Shaikh Ahmad Subay'ee who know the plots of Ihyaa Turaath, since this group is from their land of Kuwait? Is it fear, O Abaa Usamah, of the truth and strength of the evidences against Green Lane Mosque, al-Hidaayah and Iyhaa Turaath? Is it fear that the funding will stop? In all these years that you have been advised, been spoken to, even refuted, you refuse to accept your open and apparent oppositions to the manhaj of Salafiyyah - and now you expect the Salafis to fall for yet another political trick of yours - What is it that you hope for? Let us hear your thoughts: "Ahaa! We have another group of Shaikhs who still don't know of our deviations, so let's try and play like we're the victims of these vicious 'hizbee hadaadees' at al-Maktabah as-Salafiyyah! Let us play on the fact that these mashayikh may not know the detailed proofs against the innovators and callers to misguidance that we work with, the one's we love and make money with." And is this what you call Salafiyyah?! Shame on you. 2009: Ahsan Hanif (Current committee of Green Lane Mosque) with Jamal Badawi, Muhammad al-Shareef, Salaah as-Saawee etc?? Since when did Ahsan Hanif become a Shaikh? So you still want to know what's wrong with Green Lane Mosque?! This Ahsan Haneef is a youth who has been given the title of 'Shaikh' just like Abu Usamah, so as to make the people think that these opposers of the Salafi Manhaj are Scholars or worthy of taking knowledge from. Note the lavish praises of Alshareef for Anwar al-Awlaki! The connections and alliances of these people clearly show us what methodology they are upon. They are accommodators for the people of innovation. They befriend them and share platforms with them, they want the Salafi youth to water-down the true principles of Salafiyyah. So Salafiyyah becomes nothing more than a title to rally the youth around. This is the Salafiyyah of Green Lane Mosque!! Now who will claim the differences between Green Lane and al-Maktabah as-Salafiyyah are personal and not religious? The Shaykh mentions the corrupted statements of Abu Usamah adh-Dhahabi against one of the Companions, and his indications against Shaikh Ubaid al-Jaabiree and al-Maktabah as-Salafiyyah (Salafi Publications). The Shaikh advised Abu Usamah not to use machinations and self-contradictory statements - i.e. accusing clearly and falsely a Companion of being a Faasiq and then later he claimed, swearing by Allaah, that he didn't know he was a Companion! And then making indications against Shaikh Ubaid al-Jaabiree in trying to defend himself! And then accusing those who corrected him of being Ghulaat and Hadaadees! An important Q&A session from the Seminar 'Holding on to Islaam in Times of Fitnah' (Oct '08, Toronto, Canada). Our good brothers, Abu Hakeem and Abu Khadeejah address some questions concerning some of the groups and personalities of the day who clothe themselves with the garments of Ahlus-Sunnah, as-Salafiyyeen whilst cooperating with Ahlul-Bid'ah. Important questions are posed concerning Yaasir Qadhee, Abu Usaamah and the al-Maghrib institute. [Q9]: Concerning the smokescreen 'You didn't advise them/ you are looking for errors (to harm them)' [in regards to Yaasir Qadhee, Abu Usaamah etc.]. [Q10]: The legacy of Yaasir Qadhee/Abu Usamah working with Ahlul-Bid'ah whilst claiming Salafiyyah. Abu Awais takes time in explaining the errors of Abu Usamah so that the people can protect themselves from his deviations. Abu Usamah is currently in the UK and has increased upon his deviation with his heavy involvement with the misguided "Markaz Jamiat Ahl-e-Hadeeth"